Lovecraft is all up in your grill in the upcoming "Altitude"
The fading days of summer have just turned out to be an absolute Tentacle-palooza. First, we had the announcement of the DVD release of the Lovecraftian “Closet Space”, Then there was the blockbuster announcement of Guillermo Del Toro and James Cameron teaming up to do “At the Mountains of Madness”. Now, we have news that October will also see the release of Kaare Andrews’ What-The-Hell-Is-That-In-The-Clouds “Altitude”. I think this only made it out as minuscule article over on The Crash back in December of last year so it’s only taken the better part of a year for it to come out. And with its release, Anchor Bay has finally come out with an official trailer – which still looks remarkably like the two previous unofficial trailers. I said it then and I’ll say it again – it looks like a standard “teens in trouble” movie with a Megan Fox starter kit. Ordinarily, that would be enough to kill any excitement for the movie for me. But hey… this movie has tentacles. Altitude follows a group of teens on a weekend getaway aboard a small plane that suddenly turns deadly for the rookie pilot (Jessica Lowndes) and four young friends: Julianna Guill (Friday the 13th, “90210”), Ryan Donowho (Bandslam, “The O.C.”), Landon Liboiron (“Degrassi: The Next Generation”) and Jake Weary (“As the World Turns”). 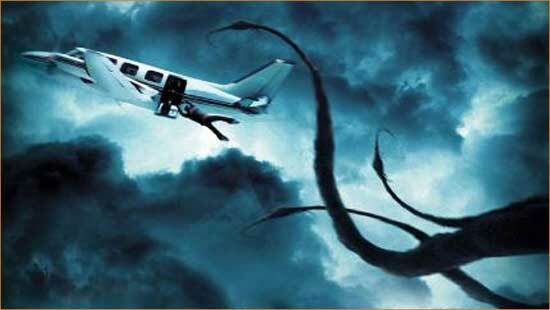 Minutes after the group takes off, an unexplained malfunction sends the aircraft climbing out of control into the heart of a mysterious storm. Unable to get their bearings or contact the ground, the survivors gradually realize they are locked in combat with a terrifying supernatural force.